Recently Jeanetta and I traded dining tables. I needed one that was long and more narrow. She needed one that was slightly shorter and wider. Always thrift-minded, we hatch the perfect scheme – TRADE! This is the table I got. Only it was originally black. And it looked great. It was a lovely table just as it was. But it wasn’t me, it wasn’t our house. 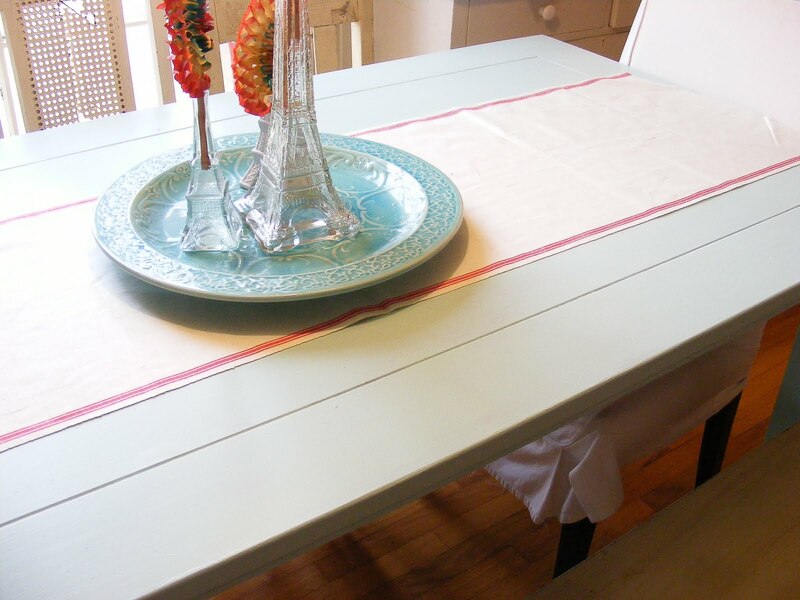 During our recent snow storm I spent a whole day painting everything that would stand still – including this table. The color is called Always Aqua and I got it in Kilz base at Wal-Mart. Of course adding one new piece of furniture to a room in my house is like pulling a thread on a sweater – it starts a chain reaction. 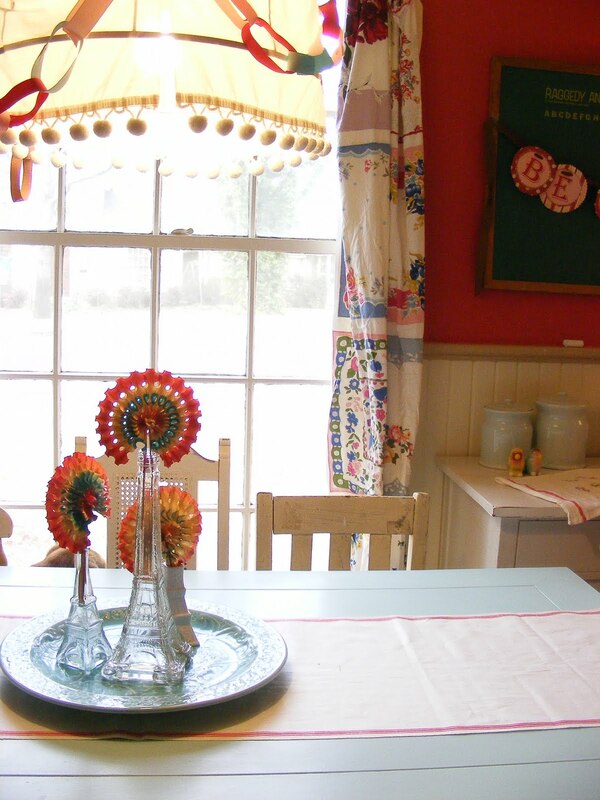 I am still on undecided on the red walls – leave ’em or change ’em – but for now I have had all the painting I can stand…. It looks lovely. Perhaps it will be some much needed motivation to paint at least one of the 4 pieces I have sitting around here in need of paint since we moved! I think I like the red walls. 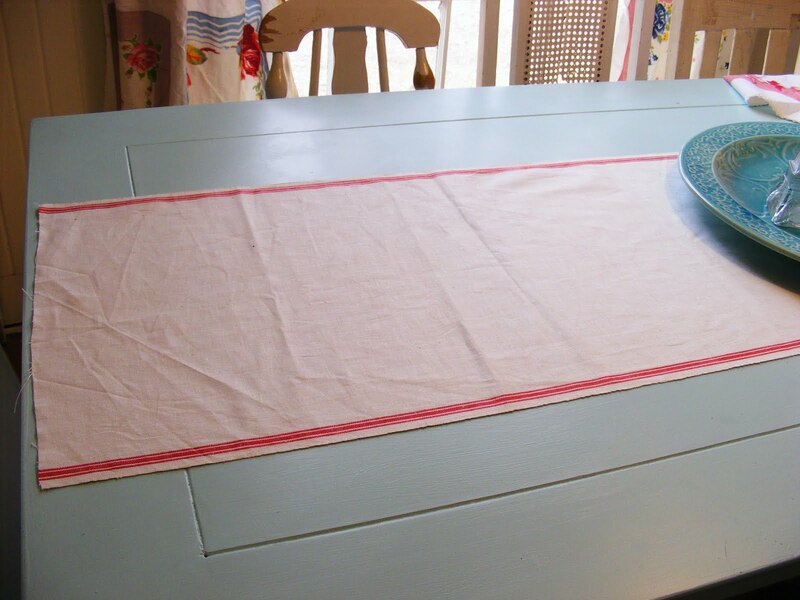 Especially how you took the table runner and tied the color in. It looks nice with the light blue. its look great, u sound just like me always painting things, 2 wks ago i painted alot of things blue last night they went back to cream, now the kids say it looks boring, cant please them all. 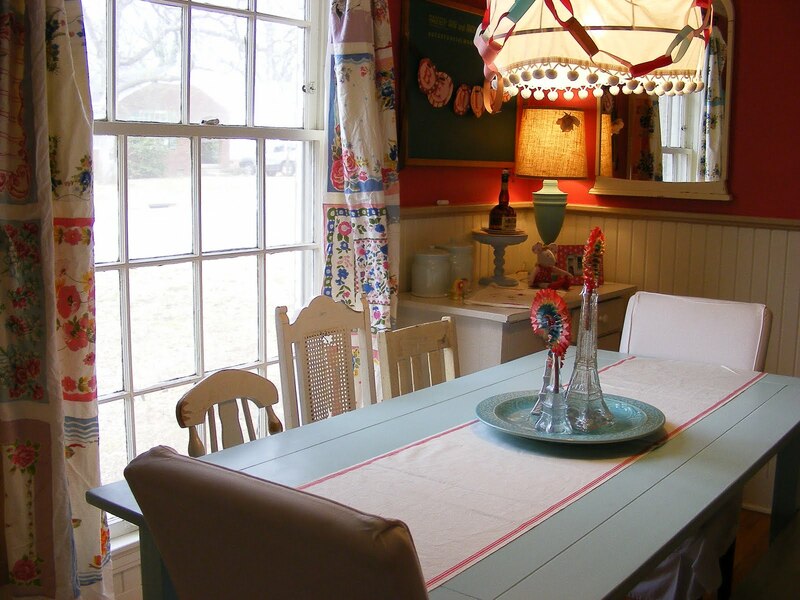 Love the blue table & the whole “fresh” feel of your dining room! You've inspired me – I'll be changing mine up later. I like the red walls, especially with your chair rail. The room is very cozy. And are the curtains made from vintage hankies? Super super cool!! How neat you could both win in the trade!! 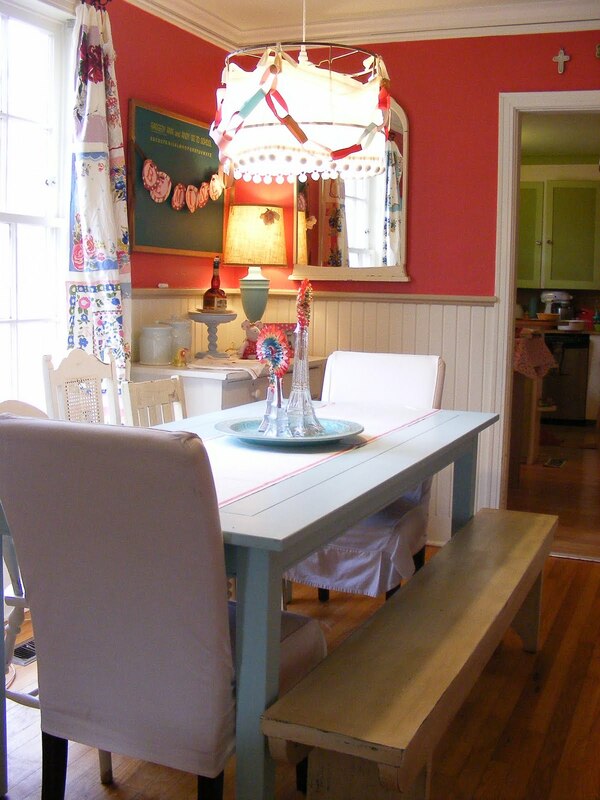 I love the blue and the red, what a completely delightful eating area! There isn't one thing that I don't like about this room! Everything looks wonderful including the red walls. Such a pretty room, just as it is. I sooooo love those curtains! What a brilliant solution. I adore the color! I've been thinking about painting mine aqua too! Love this! Any shots of what the room looked like before? We're always looking for before & after stories. Those curtains are so cute. It looks nice with the light blue.